Growing up I had beets only one way – bottled with vinegar and onions. I liked them but they weren’t a staple for me. That’s until I went to Argentina, and that is when my love affair with beets started. How we use peas and carrots as a side, they use beets. Almost every dinner had a side of beets prepared in some delicious way. This recipe happened in my attempt to save a sad can of beets. I usually use fresh, but bought a can a while back. When I opened it the beets were tasteless, even their beautiful jewelled colour had faded. I know beets and goat cheese are a perfect match, but these beets needed to be brought back to life. I thought back to the bottled beets I grew up with and dialled it up a notch. I warm the beets with red onion on the stove with a little olive oil. Once they are hot and the onions softened, I hit it with a splash of balsamic vinegar. This brighten up the beets and onions and gave it a sharp sweet flavour which is complimented by the soft creamy goat cheese. 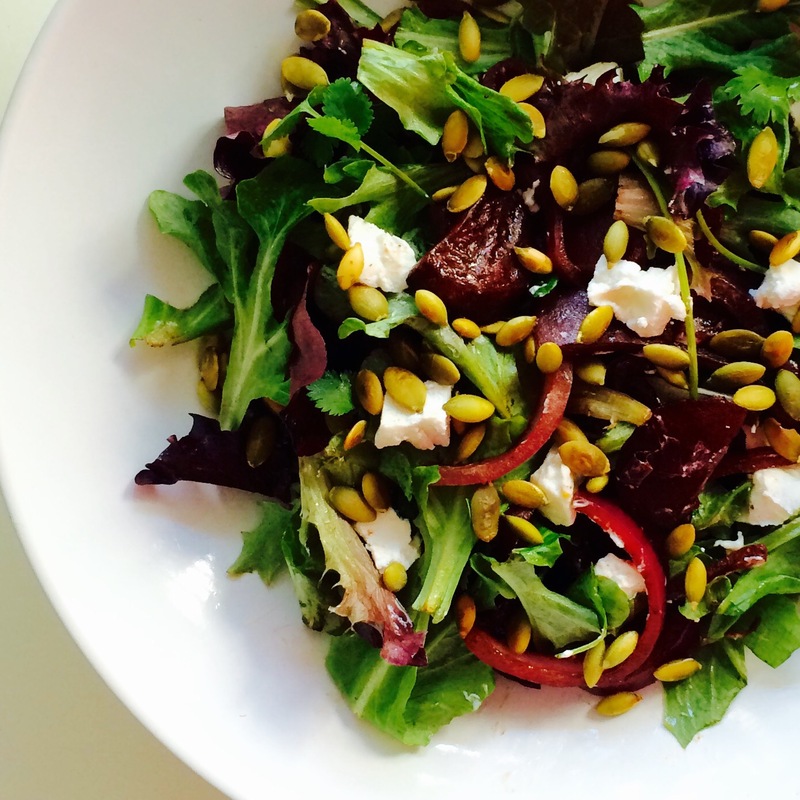 Toasted pumpkin seeds are my new favourite snack and add a wonderful crunch to this salad. In a frying pan on medium heat add olive oil. Chop beets into slices and add to pan. Chop onion into half rings and add to pan. Add salt. Once onions are softened add balsamic vinegar. Stir well to let onion and beets get coated in the balsamic. When the balsamic has been absorbed and the pan is dry, turn off heat and let cool. In a small frying pan on medium-high heat toast the pumpkin seeds. They are ready when they get puffed and start to pop. Do not walk away – watch them. It doesn’t take long and they can burn really fast. On a bed of greens add the beets and onions. Toss, the beets and onions have oil and vinegar in them and dress the salad. Add goat cheese and finish with toasted pumpkin seeds. The beets and onions are enough for 4 single salads or 1 big family salad. But make this your own salad. Use as much as you want and whatever greens you like. Add as much cheese and pumpkin seeds as your heart desires. Enjoy!